The TFI™ Preparation Guide is an excellent tool that can help you gain practical experience towards scoring the highest possible score on the test. The Guide allows a candidate to practice with the guidance of a language teacher, or even on his own, thanks to the answers that are detailed for each question. Whether he is a beginner, at the intermediate level, or the advanced level, the candidate will find a variety of questions targeted at various levels. 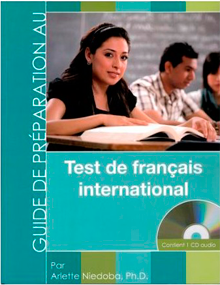 An audio CD for the Oral Comprehension section, recorded with different voices and different accents. Transcriptions of the questions and the conversations of the Oral section have been added to facilitate oral comprehension. An assessment with a teaching approach: 100 questions with the correct answers explained An evaluation report : 180 questions with the correct answers explained.